Discover wildlife at its finest, lunch at the Crab House and free time on the Wildwood Boardwalk in New Jersey. 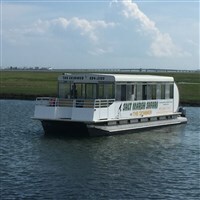 Today we will board The Skimmer to discover the amazing nature of the pristine and protected salt marshes in Cape May County, NJ. Lunch will be included at the Crab House followed by free time to stroll the Wildwood Boardwalk. Discover wildlife at its finest in the beautiful back bays of Cape May County. The experienced and knowledgeable crew will guide you through some of the most pristine and natural places in New Jersey while you learn about birds, crabs & other marine life and how they fit into the salt marsh ecosystem. You will be amazed by the amount of wildlife that a salt marsh can support. Over 400 species of birds, more than 300 species of fish, and even more marine invertebrates inhabit New Jersey and many of them call the salt marsh their home. Passengers will be divided into two groups, half of the group will do the cruise first while the other half of the group does lunch first and then they switch activities. The included lunch is at the Crab House. The rest of the afternoon will be free time to stroll the Wildwood Boardwalk. There will be a rest stop enroute home.